I'm having trouble getting clarity on the Dean G mod for these speakers. Google searches pull up youtube videos where people claim they have better mods than the Dean G, but based on what I read, the Dean G mod is what I need. Do you want the full blown mod or just the resistor mod? Probably could only afford the resistor mod, but I'd be interested to hear how to do both. The resistor mod is easy and cheap. It also gets you about 75% of the way to the full blown mod. You'll definitely notice a difference. I think I have Deans directions somewhere. I'll try to find them and copy and paste it for you here in this thread. Found it. I have pictures of when I did mine somewhere as well. This is a copy and paste from Dean. There is a section of the RF-7 network called "a notch circuit". It is designed to reduce a resonant peak in the driver (tweeter). Klipsch reduces it, but does not flatten it. This is why the RF-7, as wonderful as it is -- doesn't always sound that good with music. Paralleling the 10 ohm resistor with the 2 ohm resistor takes it down to 1.66 ohms -- which really helps to smooth out the top end. Like I said in the post, not as refined as the full upgrade, but helpful nonetheless. 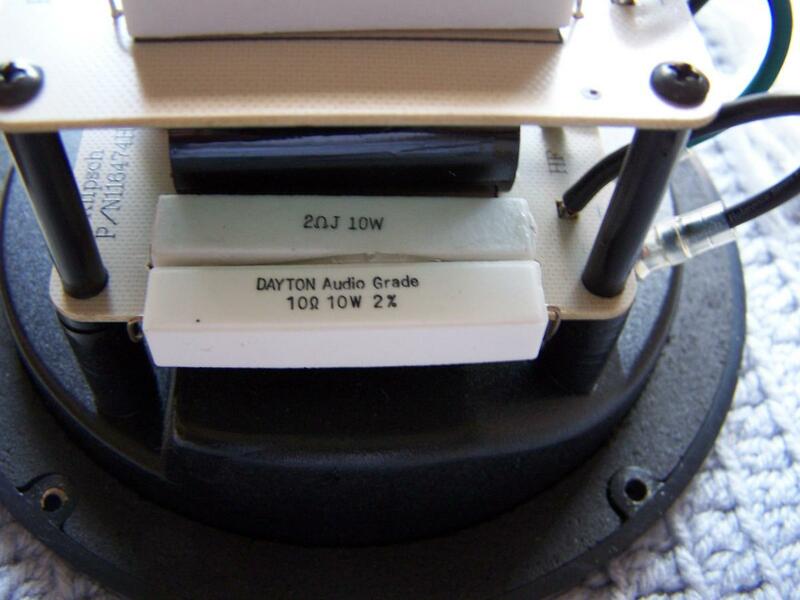 You can use any kind of 10 ohm resistor you want, but it should be rated for at least 10 watts. Do you know how to solder? Here's the picture of the additional resistor. I hot glued it to the resistor next to it, bent the leads around the board and soldered them together. You can see that it hangs slightly off the board. That was the easiest way for me. This is a picture of the RF-7. The RC-7 can be done as well but is in a different location. EDIT: click to enlarge the picture. Same crossover from the side. Very helpful, thank you for the pictures. How hard should it be to solder for someone who's never attempted such thing? I do not know how to solder and wouldn't want to risk damage. By the way, it seems that you just solder the 10ohm resistor to the already connected 2 ohm resistor? Any idea the easiest way to get to the crossover? How hard should it be to solder for someone who's never attempted such thing? Impossible for me to answer. 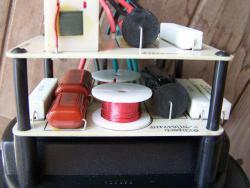 You can get the soldering equipment and practice on scrap wire and such. I know you don't know me from Adam, but if you bought the stuff and sent it all to me, I'd be happy to do it for you and send it back. It doesn't take very long to do. If you're going to have audio as a hobby you really need to learn to solder. You'll do it more than you think. There's plenty of you tube videos to watch to help you learn. This is a good community, with 24k posts I know you're not trying to steal crossovers from someone looking for help. I may look in to trying to do this myself, but I am very interesting in getting the mod done. Thank you for all of your help. Not a problem. Post here or PM me if you have any questions. Sure thing. Last question, if you're familiar, is what is the best way get to the crossover? The crossover is on the back of the terminal cup. There are 4 torx head bolts that hold it on. You will however need to remove the tweeter horn to disconnect the wires on it and the top woofer. Be sure you pay attention to what color wires go on each particular terminal. The tweeter is deceptively heavy. Sometimes it's easier to remove it with the speaker laying on it's back so you don't drop it.